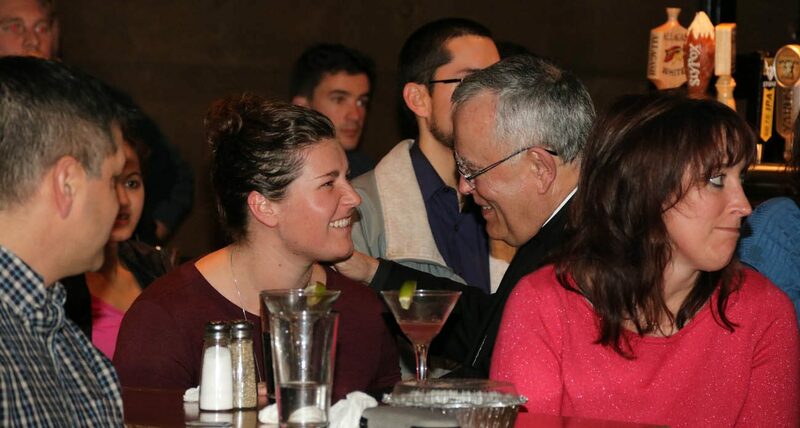 One active group of Catholic young adults got a chance to chat with Archbishop Charles Chaput during a Theology on Tap question-and-answer session Nov. 29 at a Lansdale bar and restaurant. It was a unique way for about 120 young people to hear more about the Catholic faith while sharing their own thoughts in a relaxed social setting. While Metanoia meets each month for Theology on Tap — a program of lectures sponsored by the Archdiocese of Philadelphia and running in various archdiocesan parishes — one of its goals has always been to host one with Archbishop Chaput. Father Chris Moriconi, parochial vicar at St. Eleanor Parish in Collegeville and spiritual director of Metanoia, opened the evening with a prayer and welcomed Archbishop Chaput. “I thank you for the opportunity to be with you,” Archbishop Chaput said in his opening remarks. Archbishop Chaput talked about his latest meeting in Rome with Pope Francis, one of about three to the Vatican each year. His four-day trip ending Nov. 23 with Permanent Council of the Synod included a session on how to counsel young adults and how the church can take advantage of the many talents young people have in the proclamation of the Gospel. Key to that ministry in the archdiocese are Jacob King and Megan Mastroianni. 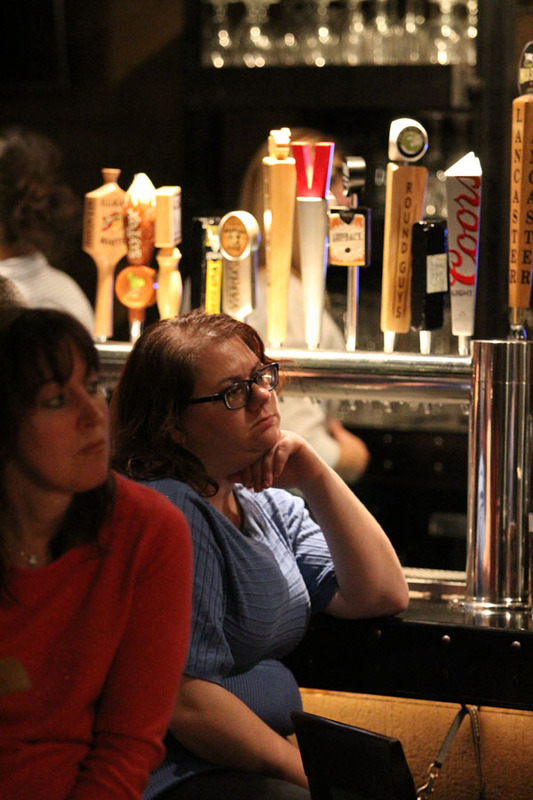 The director and assistant director, respectively, of the archdiocese’s Youth and Young Adult Ministry also attended the Theology on Tap session. Archbishop Chaput also spoke about a book a new book he has published, titled “Strangers in a Strange Land” (Henry Holt, 288 pages) before beginning his Q&A. With a new church year underway, now is a good time to listen attentively and put that skill to good use, the archbishop suggested. That is especially important during Sunday Mass and throughout the week. In “Strangers in a Strange Land” Archbishop Chaput focuses on living the Catholic faith in contemporary American culture. He previously read “Stranger in a Strange Land,” a 1961 science fiction novel by Robert A. Heinlein, in which the character Valentine Michael Smith comes to Earth after being born and raised on Mars. Upon his arrival on Earth, he shares his Martian culture experience. On the real Earth of today, “The world in which we live becomes stranger all the time,” said the archbishop. He discussed how Christians are becoming more and more out of balance in today’s society. Attendance at Mass continues to decline, Archbishop Chaput said, pointing out that 75 percent of Catholics in the Archdiocese of Philadelphia went to Mass during the 1950s. That has dropped to 20 percent today. Amy McGuiness of St. Agnes Parish in Sellersville said she believes that one reason why young people may choose not to come to Mass is because they feel that they are being judged when they attend, particularly if they arrive late or leave early for any reason. She is glad religion can be promoted through social media. Otherwise, young people may not be aware of organizations such as Metanoia that invite people to talk about their religion. “This is a beautiful way to sit here and discuss our faith,” McGuiness said. Archbishop Chaput observed how today’s young people find it most important to respect others’ choices and to accept people for who they are. In addition to Theology on Tap, Metanoia has several opportunities to bring young members of the community together including game nights, Bible study sessions and holy hour devotions at various locations in Montgomery County. The group supports Catholics in their 20s and 30s who are trying to strengthen their faith and get to know other local Catholics in a world that is changing.